This page will walk through Angular OnInit and OnDestroy example. Component and directive has a full lifecycle managed by Angular. OnInit and OnDestroy interface has methods ngOnInit() and ngOnDestroy() respectively. ngOnInit() is called only one time after the component/directive is constructed and ngOnDestroy() is called just before component/directive is destroyed. ngOnInit() is used to perform complex logic and fetching data. ngOnDestroy() is used to release resources to avoid memory leaks. constructor should be used only for local variable initializations. All complex logic and data fetching related task should be performed in ngOnInit() so that initializing component/directive will be easy and we need not to think about their complexity. 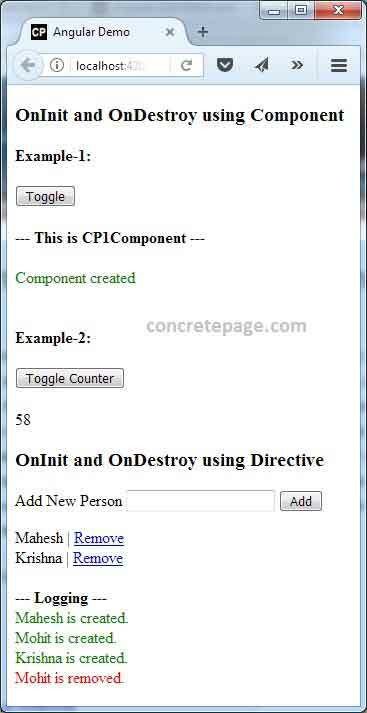 Now we will provide complete example of OnInit and OnDestroy using component and directive. OnDestroy interface is a lifecycle hook. It has a method ngOnDestroy(). It is called for cleanup logic when a component, directive, pipe or service is destroyed. ngOnDestroy() is called just before component/directive is about to be destroyed by Angular. It can be used for following purposes. 4. Free resources that will not be garbage collected automatically. If we don't perform the above task in ngOnDestroy() then memory leaks are possible. For the example a component will use OnDestroy as following. Here we will provide the use of OnInit and OnDestroy using directive. We will create service for logging that will be LoggerService. In directive when ngOnInit() and ngOnDestroy() will be called then it will set a log using LoggerService. We will add and delete persons in our demo and spy them using directive. The array of persons will be iterated using ngFor. For each and every row, our directive cp will spy the addition and deletion of persons. We will pass person name to directive. When person will be added, ngOnInit() of directive will be called and when person will be removed , ngOnDestroy() of directive will be called. We will also display logs of addition and removal of persons. Here we will provide the use of OnInit and OnDestroy using component. We will create a component that will be included within another component using selector. Find the component. Using ngIf we will add and remove CP1Component in parent component AppComponent . When CP1Component will be added, ngOnInit() of that component will be called and when this component is removed, ngOnDestroy() of that component will be called. We will log addition and removal of component in parent component AppComponent . Now find the example of OnInit and OnDestroy to start and clear interval as real time scenario. We will create CounterComponent that will start counter with setInterval() using ngOnInit() method and will clear interval instance using ngOnDestroy() method. In AppComponent we will add and remove CounterComponent using ngIf . When CounterComponent will be added, the counter will start because ngOnInit() will be called. When we remove this component, then ngOnDestroy() will be called that will clear interval instance. Hence there is no possibility of memory leak because of setInterval() . Find the CounterComponent. We are adding and removing above component in AppComponent. Now find the application module. To run the demo application, find following steps.